How to apply for new smart ration card online in tnpds? How To Apply For Your Smart Ration Card and How To Check the Status Thereof? The new Smart Ration Card is a digitized card for collecting your ration from now on. Tamil Nadu has started issuing smart ration card to the people. This has been launched by the Tamil Nadu Government. The new smart ration card in Tamil Nadu aims to replace the old conventional ration cards and will thus be able to have a complete software of the individuals drawing food and other items under the public distribution system in the state. In the very beginning, the whole system may sound a bit cumbersome and difficult to the commoner, as all of them are as tech savvy. However, the process of applying for the card is quite easy and straight forward. With a little knowledge of operating a computer and the Internet, you can fill up the form for registration, and also check the status of your submitted form. How To Apply For The Smart Ration Card online in Tamil Nadu via TNPDS? You have to apply online for registering your name for the Smart Card. Below is given a complete step – by – step procedure of how to apply online for the Smart Ration Card. Just follow the steps, and in no time, your registration is done. To find updates on the status of your application form as well, there are easy steps to be followed. Let’s first talk about the Online Registration of Smart Ration Cards. 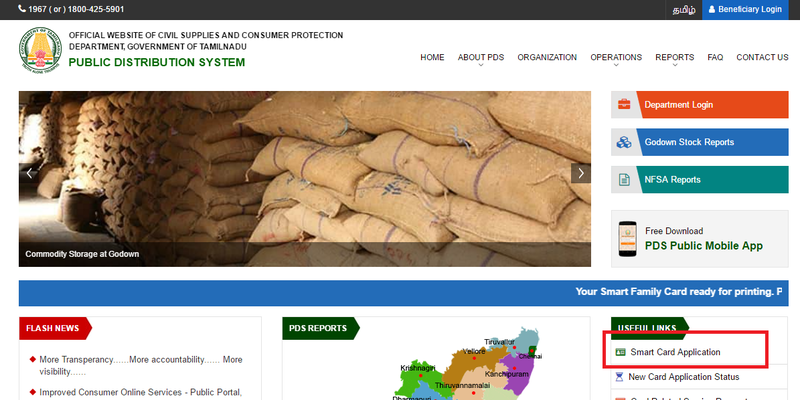 ® The very first step in the process is to log on to the official website of the Department of the Public Distribution System of the Tamil Nadu Government www.tnpds.gov.in. The default language is Tamil. However, you can change it to English too by using the option found in the top menu bar. ® Once you are inside the website, you have to click on the link for the online application for the Smart Card. ® You will be able to spot the link on the right – hand side of the home screen of the website. ® There you will find a list of “Useful Links”. ® The very first option is the one you are looking for. It has a title of “Smart Card Application” in these exact words. ® Click on this link. ® An application form issued by the PDS department of the TN Government gets opened. ® This is the new smart card application form where you register for Smart Ration Card, and it will be opened in a new page on the browser. ® Now you got to fill in the form carefully, and properly. The details in every field, mandatory or optional, should be absolutely correct. First enter the name of family head after choosing the caption. Then the father/husband's name should be entered. Fill the address line1, address line2 and address line 3 appropriately. To type in Tamil, type the words in English and press space in the Tamil fields. They will be automatically converted into Tamil words. Choose the district from the district dropdown. Enter the mobile number to which you want to get notifications and other information. This will be your registered mobile number. Enter landline number if you have. It is an optional field. Enter the email address if you have. This is also an optional field. Now enter the family member details by clicking the Add Member button. You have to provide aadhar number for all family members whose age is above 5. You have to enter name, gender, date of birth, relationship too. You have to add family head details first. Select proof of residence and upload the documents. Enter the details of gas connection. You have to enter the name of the person in whose name the connection is registered, oil company details, lpg consumer number, name of the gas agency, number of cylinders for each gas connection you own. Then read the declaration carefully and check it if you are fine with it. ® The next step is to upload your photo. ® For this, you have to move forward. So, do not click on the “Submit” button or do not press the back button either. ® The next question is how to upload an image of the document as your address and identity proof. ® Scan the document that you want to submit as your proof of address. Else you may also take pictures of the document with your smartphone and transfer it to the application form. ® Here, you need to remember that the image has to have an extension of .jpeg, .png or .gif. ® Once the image has been uploaded successfully, your form is complete. ® Now click on the ‘Submit” button. ® Once this stage is done, the system will provide you with a reference number that will be sent to you on your phone as well as your mail address. How To Check The Status Of Your Online Registration Form For new Smart Ration Card? This is required after the form has been duly filled up, and you need to check on the status of the form from time to time. Enter the reference number in the appropriate field. You will be able to know the status of your application within seconds. Here is a video on how to apply for a new smart ration card online in TNPDS in Tamil Nadu. Hope you find the article on how to apply for new smart ration card is useful for you.